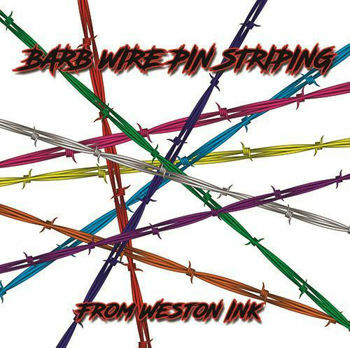 Custom Barbed Wire Pin Striping from Weston Ink. This is a unique design made to have an end point on both sides. If you wish to make it longer they are designed to be cut in front of back of a barb and then extended with an additional one to make your application as long as you need it and still have that closed end look rather than just stopping like normal stripes would. It's a great way to jazz up your motorcycle, car, truck, boat or what ever you want to put them on without a huge expense of a custom airbrush paint job. Best part of using vinyl is that if you decide to chage it up you can. These graphics are also safe to clear coat over should you want to make it more permanent. Designed and produced by Weston Ink's professional designers using the the best materials and newest manfacutring equipment. Using the newest printing technology with a 7 color process these graphics have vidid color and are highly detailed. Industrial grade inks also extend the life of the graphic for years to come without any fading. This product has reflective options. We produce these from the same materials used on emergency vehicles. Our reflective products look just the same as the non reflective designs during the day but at night when light hits them they reflect grabbing your attention in full color. With our special 7 color translucent ink reflective process all the color within the graphic reflects. It's a great attention grabber for your vehicle as well as a great safety feature at night. Perfect for your motorcycle bacuse you know others don't always see you. With these and some extra loud pipes you may just get noticed!